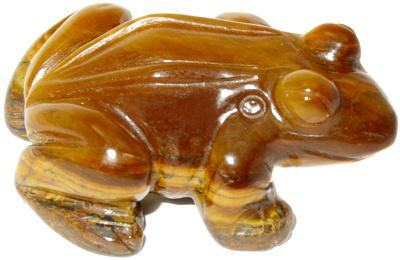 Tiger Eye frog shines from every angle. High quality, high polish, iridescent Tiger Eye energizes the body and focuses the will. The frog is a well known Feng Shui "wealth cure" said to increase prosperity and protect goods. Tiger Eye is a stone which aggressively focuses energy toward fulfilling heartfelt dreams. "This mineral brings together the vibrations of Sand and Sunlight, synthesizing the energies of Sun and Earth." This stone harnesses the forceful, solar-charged earthy vigor which is the hallmark of the enthusiasm and love of life exhibited by male adolescence. If you need enthusiasm and a release of introversion, this aggressive Yang stone can help release inhibition while remaining balanced or grounded with the Yin (sand/earth) energy. It magnifies personal energies of desire, enthusiasm, vigor and action.